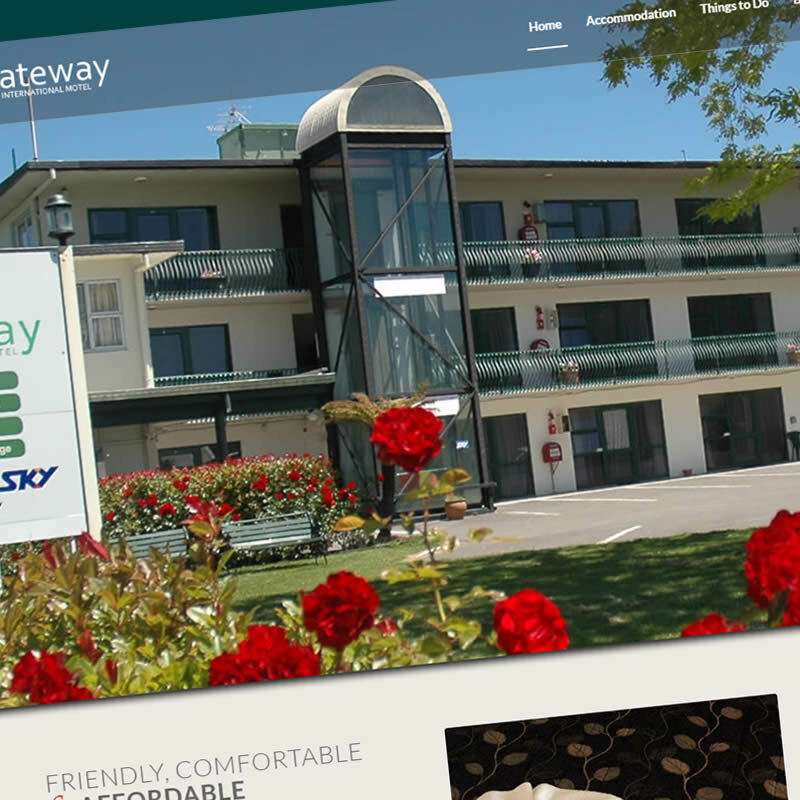 We’re pleased to announce the launch of the new GatewayRotorua.co.nz website for the Gateway International Motel, Rotorua. After being chosen by moteliers Alex & Selina, our Rotorua web design team got to work, crafting a streamlined, responsive website to replace their aging original website in order to better showcase their business. The online accommodation industry is notoriously competitive, so we developed the new website to be as SEO friendly as possible; both at launch and for the foreseeable future. We also implemented comprehensive analytics in order that we can measure traffic and make ongoing, smart Internet marketing decisions. In hospitality, they sometimes say ‘the first bite is with the eye’ and with that in mind, we stepped in and offered to take a few more photos of the property that we felt would be an improvement, including the new property shot on the home page. We just couldn’t let that blue sky and beautiful rose garden go to waste. We invite you to take a look at the new Gateway International Motel website. https://rotoruawebdesign.co.nz/wp-content/uploads/2017/02/gatewayinternational.jpg 800 800 admin https://rotoruawebdesign.co.nz/wp-content/uploads/2016/10/logo.png admin2017-02-03 20:59:152017-02-03 20:59:15GatewayRotorua.co.nz Launches Today! As well as developing awesome websites, Go Robot houses a plethora of Rotorua Google Adwords smarts & experience. We are particularly proud of the latest website launch from Go Robot. The NZ Bluestone website is a prime example of a search engine optimised sales tool. © Copyright - Rotorua Web Design 2016 - Another lovely, lovely website from our alta ego, GoRobot Ltd.